Bennett sprints to first win of the season in circuit race around San Juan. San Bennett (Bora-Hansgrohe) won the final stage of the Vuelta a San Juan with a powerful sprint from far back in the field, Sunday. The nine-lap circuit race around San Juan saw Winner Anacona (Movistar) finish in the bunch to seal the GC, with Julian Alaphilippe (Deceunick-Quick-Step) second overall. After the surprise breakaway win of stage 6, the bunch was careful to monitor groups going clear, and it took the first 40 kilometers of the 141km stage for a break to form. The break of Julen Amezqueta (Caja Rural – Seguros RGA), Carlos Barbero (Movistar), Daniel Díaz (Municipalidad de Pocito), Sergio Aguirre (Municipalidad de Rawson Somos Todos) and Fabio Duarte (Medellin) gained only one minute on the peloton, which was being led by Bora-Hansgrohe, Team Dimension Data, and UAE-Team Emirates, working for Bennett, Mark Cavendish, and Fernando Gaviria respectively. The breakaway was not drawn in until late in the race, and with 17km to go a few riders were even allowed to bridge across to them. However, the sprinters’ teams controlled it perfectly to bring the group back with just 6km to go. 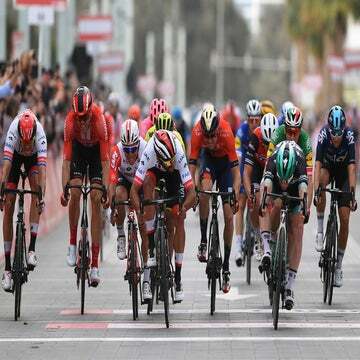 As the line approached, Cavendish looked in a strong position before fading, with Peter Sagan (Bora-Hansgrohe) stretching the pace at the head of the race on behalf of Bennett. 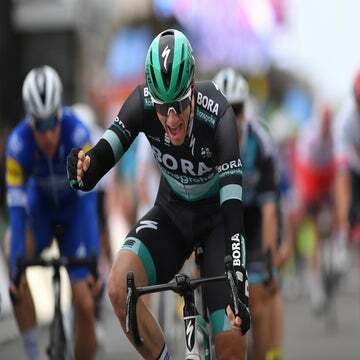 The Irishman was able to latch on to Deceuninck-Quick-Step’s lead out before coming around Alvaro Hodeg (Deceuninck-Quick-Step) and Erik Baska (Bora-Hansgrohe) in the final meters in what proved to be a remarkable turn of speed. Hodeg came second in the stage, with Baska third. Anacona finished in the peloton to secure the overall victory, having taken the lead on stage 5’s queen stage, Friday. Alaphilippe came second in the GC, while Oscar Sevilla (Medllin) took third. Alaphillippe’s 19-year-old Quick-Step teammate Remco Evenepoel won the young riders’ classification in what was his first WordTour race.